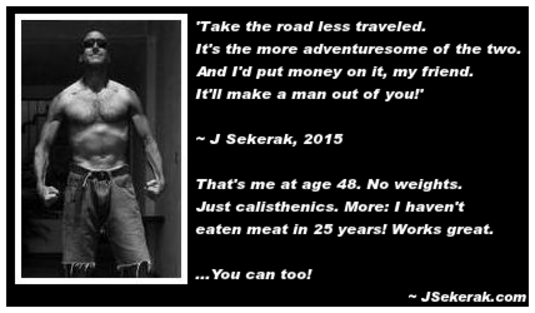 Jeff Sekerak - Build the 'Ripped,' Athletic Body of Your Dreams! No Equipment and Just 30 Minutes a Day Required. Build the 'Ripped,' Athletic Body of Your Dreams! No Equipment and Just 30 Minutes a Day Required. Body-weight exercise costs nothing but your time. About 30 minutes a day is all you need to get great results. Fast! When done vigorously, without stopping between sets, body-weight exercise releases natural HGH, or human growth hormone. HGH has been linked to deeper sleep, greater muscle mass, thicker skin, greater cardiovascular capacity - even better sexual performance! Do them consistently. And fast, efficient body-weight workouts will get you that 'ripped,' athletic look. Which may have eluded you for years. Well, when you do body-weight exercises, or calisthenics, you're getting a strength and cardio workout done in a single session. Versus the more common method of doing cardio-fitness for endurance, and weight training for strength. Thus, you burn body-fat 'like mad.' AND, build great muscular strength and definition with each workout you do. And another fringe benefit? You deeply engage your core (and every major muscle group in your body) with each exercise. Think about that! When you do just a 'regular old push-up,' for example. You have to use your abdominal muscles, your entire back, as well your chest, legs - even your feet! - to complete a repetition. You engage a ton of muscle groups as well, doing a standard squat. The same holds true for almost every calisthenic exercise you can think of. Also: Because you're using all your muscle groups at once - and NOT isolating body-parts - you can save LOTS of time on your workouts. Jump out of bed and do a set of jumping jacks. Then do a set of simple, body-weight squats. Now do a set of crunches. Follow with a set of push-ups. Now, with no rest at all, start again with another set of jumping jacks. Consider that one cycle. Repeat that cycle for a minimum of 30 minutes. Do each exercise in sets of whatever number you can, to start. If you're a total beginner that may be sets of 10. If you're advanced, it may be increments of 100 or more for you. I've found that sets of 30 to 50 work best for most. Just do your best for 30 minutes a day. You'll gain strength and endurance VERY quickly. Totally simple, but ruthlessly effective! If you doubt how tough, and how productive this can be - just try it for 15 minutes. Make sure NOT to stop for rest between sets. Your heart, lungs, and every muscle, tendon, and ligament in your body will be working, probably like never before in your life. This is the EXACT TIME AT WHICH YOU MAKE YOUR GREATEST STRENGTH AND ENDURANCE GAINS. When you force your body to 'push through barriers,' as never before. When you give it good reason to grow, like never before. I was NOT in peak condition before I began with body-weight workouts. If you look at my current profile picture? You'll get an idea of where I am now. I've never been in better shape in my life.This morning my workout was 800 squats, push-ups, crunches, and jumping jacks. I completed it in about an hour. I've got zero unwanted body-fat. I've got more strength, power and endurance - even more toughness! - than ever before. And I owe this ONLY to the simple, efficient method I've described in this article. Try this for 30 days. You'll begin to build the body you've wanted all your life. Lean, athletic, and well-defined. You'll sleep deeply. You'll wake up energized, instead of exhausted. You'll leap up flights of stairs like never before! You'll drop pounds of body-fat. You'll notice you fit into clothes, you thought you'd never wear again. And because you're building a deep fitness from the inside out - even your skin may take on a more youthful, more vibrant color. Friends and co-workers will look at you TOTALLY differently. I'd put money on it, in fact. String together a few months of these workouts. Stick to a good clean diet in the process. And I mean - work toward 100% fruits, vegetables, nuts and seeds. Try to make each meal 75% veggies. As this fills you with fiber, cleanses your digestive tract, and loads you up with good nutrition. Add beans or baked potatoes to keep satisfied, around dinner time. Do this? And you WILL begin to 'turn back the clock.' You'll be SUPER-healthy from the inside out. You'll be 'tough as nails!' And FINALLY, my friend... You'll have that lean, 'ripped,' athletic body of your dreams. At which point, you might want to send me a few before-and-after photos. Copyright 2012, all rights reserved. Consult your doctor before engaging in any diet or fitness plan. Consult your 'good ol' common sense too. It rarely steers you astray.